GRAITEC announces 19.9% turnover growth for the first Quarter of 2012, compared to 2011. After a very intensive 2011, the first quarter of 2012 exceeds expectations from a turnover and margin perspective for GRAITEC. Going more into the details, the performance of GRAITEC France, USA, Russia and Germany are absolutely remarkable. The new subsidiary in Italy has also realized a superb performance with a turnover that exceeds the objectives by +34%. 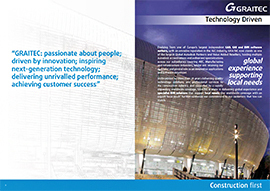 The GRAITEC Advance suite has achieved during Q1 2012 an amazing growth of +43% compared to 2011: “This is a great performance that demonstrates the growth capacity of GRAITEC solutions but also their fit to the market, customer needs and BIM environment” comments Alexandre Tartas, GRAITEC COO. Advance Steel continues on a very positive tendency growing by almost 40% during Q1, both mature markets and new markets have contributed to this success. Alexandre Tartas comments: “The impact of the Advance Steel standalone application has not been significant during Q1, due to a pretty late delivery during the quarter. We expect a real effect during Q2 and feel very optimistic since the customer feedback is absolutely amazing. GRAITEC has also registered significant sales to Strucad customers during Q1 and many contacts have been established with companies that are using this solution and are very happy to consider Advance Steel“. Advance Design continues to benefit from a high adoption rate especially on the French market that recognizes that GRAITEC provides the very best structural analysis solution on this market. “The quality of the solution provided such as the comprehensive international codes and the service provided by GRAITEC have highly contributed to the great Q1 result for Advance Design with 45% growth“, says Alexandre Tartas.